Michigan football coach Jim Harbaugh will be in attendance Tuesday night for President Obama’s State of the Union speech. The former Michigan Wolverines quarterback will be the guest of Rep. [crscore]Justin Amash[/crscore], according to a tweet from the congressman. Excited and honored that @CoachJim4UM will attend the #SOTU as my guest. He’s a leader and a champion who is making a difference. #GoBlue! 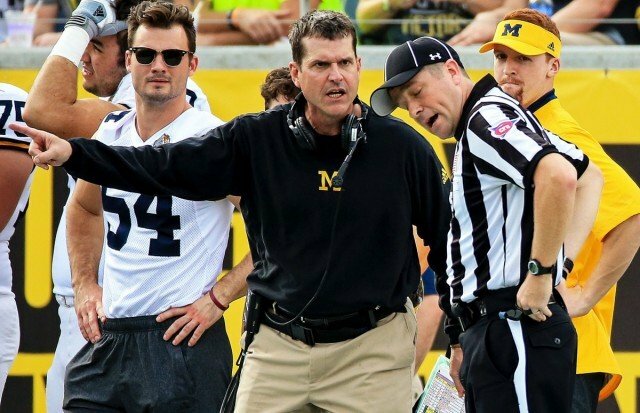 Democratic Rep. [crscore]Debbie Dingell[/crscore], who represents the 12th district in Michigan, will bring Harbaugh’s wife, Sarah, as her guest. Trips to Washington D.C. to visit government officials aren’t that unusual for Harbaugh. In April 2015 he met with the Supreme Court and tried to persuade Justice Clarence Thomas to become a Michigan fan. Harbaugh also visited with President Obama and the first lady in October 2015 to promote a public-awareness campaign called “Better Make Room,” according to the Detroit Free Press. The former San Francisco 49ers head coach took Michigan out of the gutter of the Big 10 and earned a solid 10-3 record in his first year as head coach.